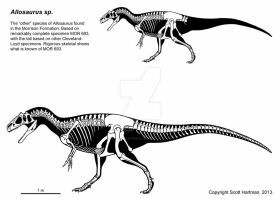 ... reconstruction based on nanotyrannus skull and tyrannosaur skeletons. There was a CAT scan on the head, and the brain is shaped differently from Tyrannosaurus'. I used this as a reference! Consensus seems to be shifting on this guy. I've been looking for one! 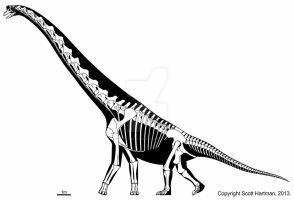 Skull seems a bit long in proportion to the body, but I assume you've looked at skull-body ratios in other tyrannosaurs, right? yes thats right, because of the complete bodyproportion the skull has to be in my opinion a little bigger. if he was an active hunter ,it would be better for him to posses a big mouth to catch his prey. 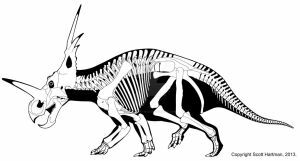 YaY!Nanotyrannus! this is my 2nd fav dino! great job! Very well done. It looks like something I'd come across in a Greg Paul book. Professional grade. I don't know which paleontologist ceb-luv is refering to (Holtz? Carr? 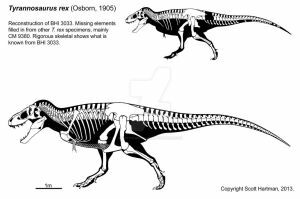 ), but there is still mixed opinion on whether Nanotyrannus is a valid taxon, or merely a juvi T. rex. Witmer presented some scans of the Nanotyrannus braincase at the 2005 SVP meeting that showed the sinuses around the braincase (among other things) differed quite a bit from those in T. rex. 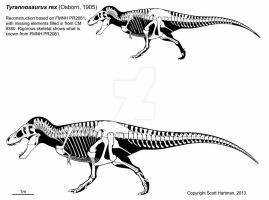 These same scans were featured in a TV program on the science channel devoted to the discovery of Jane the subadult/juvenile T. rex. 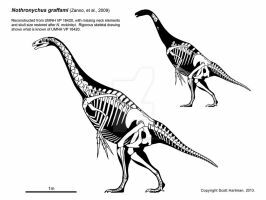 In his opinion (which carries a LOT of weight in the paleo community, due to the fact that he is The Man) the differences were too great to be a product of ontogeny alone. So, the matter is still up in the air. Not that ceb-luv was implying otherwise. There are far more differences that opoose Carr's fallacious statement. thank you for this comment. we will know it after the excavation of the first complete skeleton. Cool. Hey guess what? My advisor doesn't think that Nanotyrannus is real. He believes that Nanotyrannus is infact juvenile Tyrannosaurs. And he's a theropod paleontologist so this is what he spends his life studying. 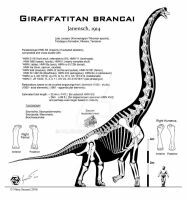 I donno, I'm more interested in Sauropods than Theropods, just saying what he's been telling me. Ok, that's it. That's my little soap box. i know that theory. maybe it is right. the most important thing for me was to create a body to this beautyful shaped skull for me a killerface!